There are many types of wing: conventional, symmetric, conventional in inverted flight, the early biplane wings that looked like warped boards, and even the proverbial "barn door". In all cases, the wing is forcing the air down, or more accurately pulling air down from above. (although the early wings did have a significant contribution from the bottom.) What each of these wings has in common is an angle of attack with respect to the oncoming air. It is the angle of attack that is the primary parameter in determining lift. To better understand the role of the angle of attack it is useful to introduce an "effective" angle of attack, defined such that the angle of the wing to the oncoming air that gives zero lift is defined to be zero degrees. If one then changes the angle of attack both up and down one finds that the lift is proportional to the angle. Figure 12 shows the lift of a typical wing as a function of the effective angle of attack. A similar lift versus angle of attack relationship is found for all wings, independent of their design. This is true for the wing of a 747, an inverted wing, or your hand out the car window. The inverted wing can be explained by its angle of attack, despite the apparent contradiction with the popular explanation of lift. A pilot adjusts the angle of attack to adjust the lift for the speed and load. The role of the angle of attack is more important than the details of the wings shape in understanding lift. The shape comes into play in the understanding of stall characteristics and drag at high speed. One can see in the figure that the lift is directly proportional to the effective angle of attack. The lift is positive (up) when the wing is tilted up and negative (down) when it is tilted down. When corrected for area and aspect ratio, a plot of the lift as a function of the effective angle of attack is essentially the same for all wings and all wings inverted. This is true until the wing approaches a stall. The stall begins at the point where the angle of attack becomes so great that the airflow begins to separate from the trailing edge of the wing. 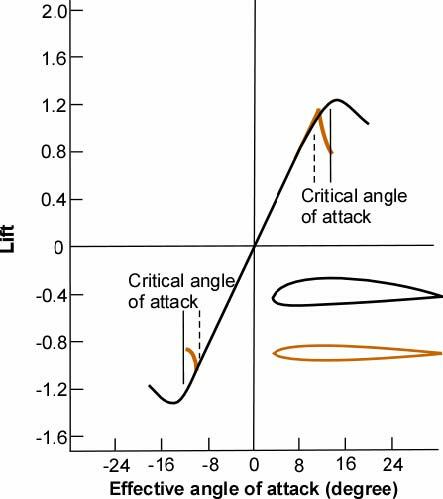 This angle is called the critical angle of attack and is marked on the figure. This separation of the airflow from the top of the wing is a stall.